If you dread cleaning floors, choose your surfaces carefully. If children eat in the dining room, do not choose a carpeted floor, but a parquet or cork one. Very light-coloured carpets, unless heavily textured, show the dirt quickly. A patterned carpet does not show the dirt as much as a plain one. A marble floor may last for years, but will be colder on your feet than linoleum. Sweep hard floors regularly, some­times as often as after every meal if you have small children, and wash them frequently. If you spill something on your floor, you must first scrape off or wipe up any deposit and then tackle the remaining mark. Many floors come with their own proprietary cleaner, or at least their own manufacturer’s care instruc­tions. Check these before cleaning. These floors should be regularly scrubbed with detergent or washing soda solution. Stubborn stains can be treated with a strong bleach solution and then rinsed well with clear water. Never use soap or abrasives; never use acid on limestone. Polishing a stone floor can make it beautiful, but slippery. A heavily soiled sealed cork floor can be lightly sanded to remove the surface dirt and then resealed (for care of sealed cork floors, see Plastic films/seals, below). Sponge unsealed tiles gently with a warm, mild detergent solution. Do not overwet them or they may crack. Polish unsealed tiles, but not sealed tiles. Linoleum should always be kept as dry as possible. Never leave oil or water standing on it and dry well after wash­ing regularly with a liquid non-abrasive cleaner, or washing soda solution, and then rinsing. Rub scuff marks with an emulsion floor polish and remove crayon marks with silver metal polish. Polishing linoleum will add an extra seal to prevent dirt penetrating the surface. Marble stains easily so wipe up spills at once with warm, soapy water, rinse well and buff with a soft cloth. Wash regu­larly with a mild liquid abrasive cleaner, then rinse and dry. Never use strong detergents, oil, petrol, paraffin or white spirit on marble. 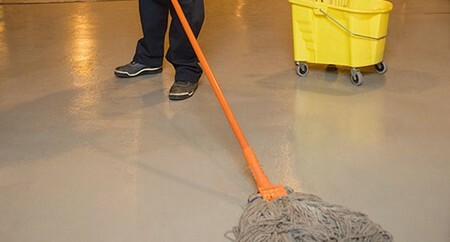 If the floor becomes badly stained, the surface can be care­fully removed by machine grinding but this is a job for a professional. Wipe up spills immediately and clean regularly with a detergent solution. Apply a little emulsion or paraffin pol­ish two or three times a year and shine before it dries. Only wash rubber when necessary. Re­move fat, grease, oil, petrol, spirit and fruit juice splashes at once and never use detergent, petrol, paraffin, wax polish or white spirit on your rubber floor. Simply wash with soapy water and then rinse, and rub off any scuff marks with a mild abrasive liquid. Always have these professionally cleaned. Never overwet or use any detergent, ammonia, washing soda, household soap or strong alkalis on it. Vacuum frequently and tackle non-greasy stains with the foam or lather of carpet sham­poo and greasy stains with an aerosol dry-cleaner. Lift loose unbacked mats occasionally to sweep the floor under them. Mist rush matting occasionally with cold water using a plant sprayer. Wash regularly with washing soda so­lution and rinse well. Use a proprietary cleaner for more stubborn stains. Do not use soap on slate floors as the scum will be impossible to remove. Clean regularly with warm soapy water or a little liquid abrasive cleaner, but only if necessary. Rub stubborn marks gently with fine wire or steel wool. Always rinse well and never use petrol, paraffin, lighter fuel, white spirit or wax polish on vinyl. In winter, keep a vinyl floor warm as cold makes it brittle.